Matrix consists of a wide range of 2MP cameras, amongst which the most advanced camera is the PTZ (Pan-Tilt-Zoom) camera. This camera is designed to provide a real-time security solution, which helps in preventing damage, rather than investigating at a later stage. Matrix 2MP IP PTZ camera is an outdoor camera designed to ensure peripheral security of large enterprises. It comes with 360° rotation capability and 30x optical zoom, allowing closer inspection of large areas, eliminating the need of multiple cameras. These cameras also come with in-built IR LEDs, thereby providing superior quality video streams even during night time. 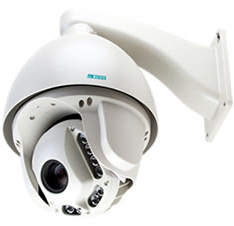 With this specialized IP PTZ Camera, Matrix helps enterprises experience the best outdoor security camera system. These systems fulfil the outdoor security purposes of manufacturing units, hospitals, hotels, banks and other similar industries.